For those who have not yet had the chance to view it, here is the February 24th ‘Hardtalk’ interview with Naftali Bennett, with Hebrew subtitles. Readers will note that whilst presenter Stephen Sackur invokes the Boycott, Divestment and Sanctions spectre, in line with what is increasingly looking like standard BBC policy, he fails to provide viewers with any information whatsoever regarding the end game of the BDS political campaign and hence both deprives them of the ability to place those threats in their proper context and whitewashes that campaign’s destructive nature. 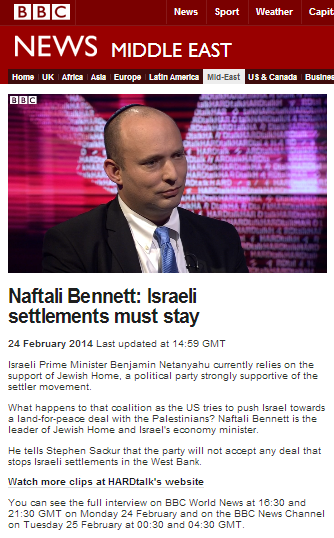 A segment of the interview was also promoted on the BBC News website’s Middle East page under the apparently deliberately simplistic title “Naftali Bennett: Israeli settlements must stay”. At the time of writing, that clip had been left up for seven consecutive days. Great Hebrew subtitles. Non-English-speaking Israelis will now be able to make up their own minds as to whether the BBC is or is not their “friend”, which Naftali Bennett assures Stephen Sackur Britain is.